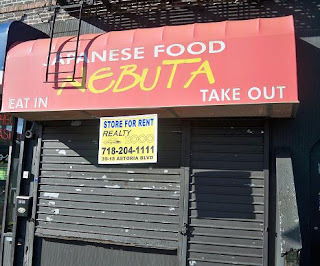 Nebuta, the convenient Japanese take-out joint near the Astoria Blvd subway stop has closed. Although it hadn't made too big of a mark in the neighborhood, it was an easy and inexpensive place to get sushi take-out and other Japanese specialty products. We'll see what replaces it and by the looks of it, a new owner hasn't been found. Holler if you know more about it. And for the time being, there's always Tokyo I.
yeah, it's a real shame that nebuta closed. i haven't really found as good an udon broth as the one they made for that price. oh well. here's hoping that should the owners try again, they have better luck.